Let's get right into it. The cover (show above) bills them as the strangest superheroes of all. The characters look dramatically different from what we are used to with modern incarnations. You might not even recognize the man hanging from the... the... bar thing. 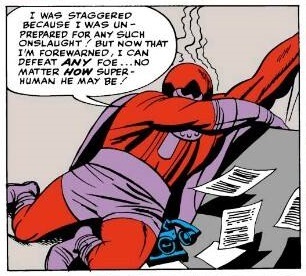 And here in Issue # 1 we're also introduced to Magneto in his red and purple garments. In this series, I will generally review them arc by arc instead of issue by issue. They are closer to a thousand issues, now, than one. So let's allow our early cast to introduce themselves. We have Bobby with his pole and boots. Angel flying in. Cyclops shambling in from behind and Beast breaking in from the back, bare feet and all. He's not the blue furry guy we all know and love. 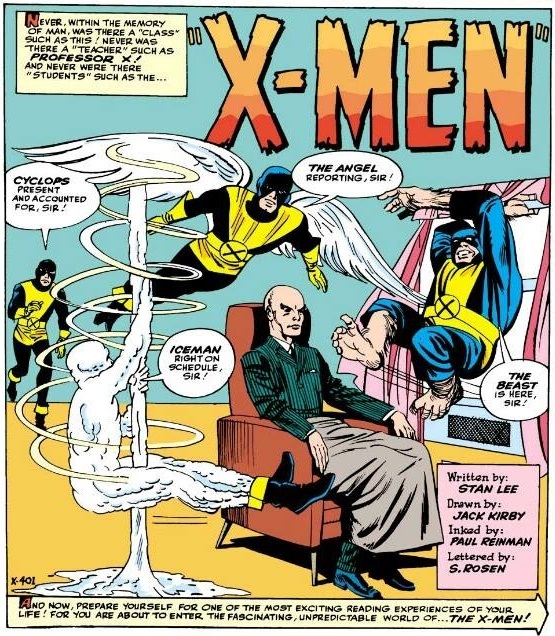 We're introduced to Professor X right off the bat as we should be. But our lineup's not complete. At this point, one page in, Jean hasn't been introduced. We should all stand up and give a little cheer for the real heroes of the X-Men. Stan Lee, Jack Kirby, Paul Reinman, and S. Rosen got the ball rolling and they pretty much put together a perpetual motion machine. At this point, many fan favorites don't exist. Our entire cast this installment is Scott, Jean, Warren, Bobby, Professor X, Hank, and Magneto. And it will stay that way a short while. They go into a training session with an Early Danger Room. The Early Danger Room where they train is nothing more than a machine with crushers, clamps, and flames. You know, easy stuff. It bears no resemblance to the one in modern stories which is more like one of Worf's Klingon Holodeck programs (Mixing genres here. Sorry.) 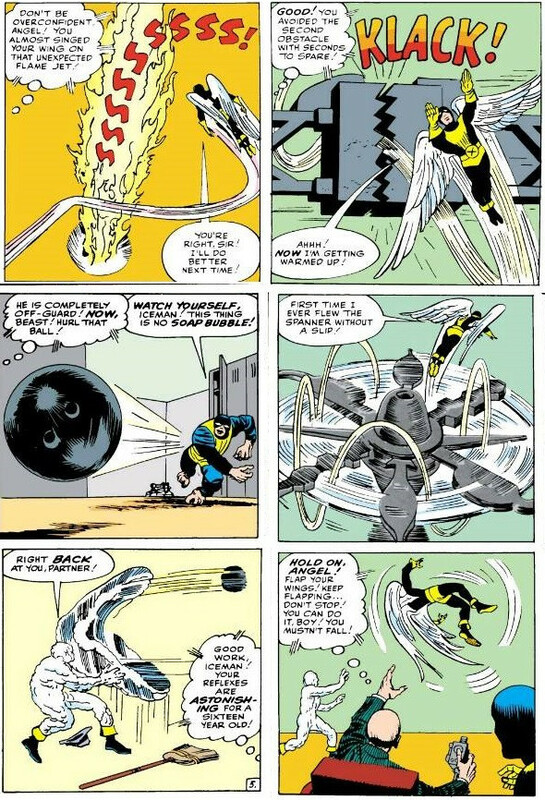 In addition to clampy hammers, fire jets, whirlygigs, and the occasional tossed bowling ball, the boys spend a few pages rough housing and being blasted by Cyclops' beam. They all dress themselves to meet the newest member. Big surprise. It's Jean Grey, going by Marvel Girl. She's looking very stylish in her dress. The Professor reclines in his chair as he introduces the others. Warren leads the charge and he and Hank compete for the position of flatterer. You have just finished the newest, most unusual tale in the annals of modern magazines! But the best is yet to come! 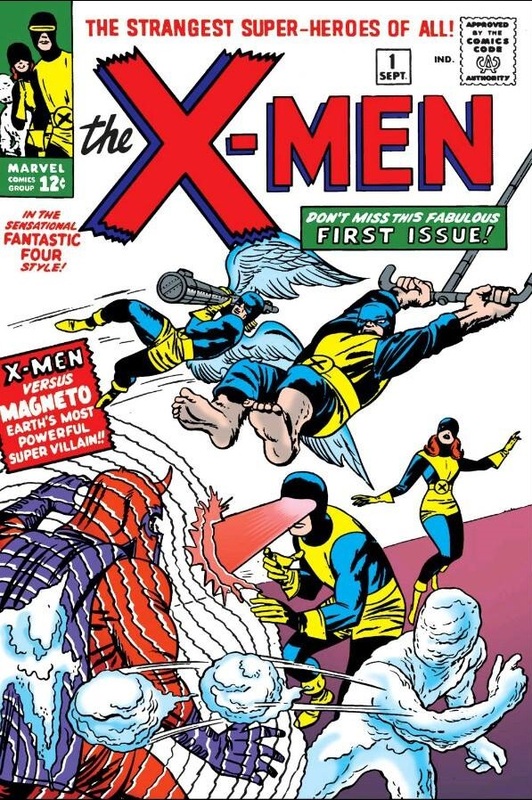 For fantasy at it's greatest, don't miss issue # 2 of X-Men, the Stranges Super-Heroes of All! Magneto is sporting a subtle purple and red. This panel doesn't make it obvious but the helmet has horns. The helmet has no purpose at this point, at least no defined purpose. That came later either as an afterthought or as something considered too trivial to mention immediately. And look at that meticulous signature. He's a polite villain if nothing else. Immediately prior to this panel, Warren shrugged himself out of his harness and onesie and got into his uniform. And they got into a Rolls Royce. This panel tells a little about Xavier, hinting at how greatly powerful he is, and wealthy. There is a funny little reference here a lot of readers won't get anymore. Bobby (most likely) says that it must have taken heaps of Green Stamps. This refers to the S&H Green stamps passed out by Sperry and Hutchinson Company. They were extremely popular. In the sixties they printed more stamps than the post office. They would receive them much like we get Kroger points or Speedy Reward Points. Special catelogues were issued where people would use the stamps as currency to get things. That's pretty much the first book. Had I been a young person in the 60s reading this, I would have definitely picked up the next one. 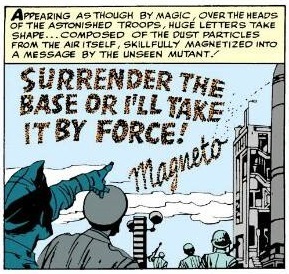 It does appear wordy compared to the more expressive, refined comics we get now. It has miles of exposition and a very active narrator, something we will compare whenever I notice it's changed a bit. 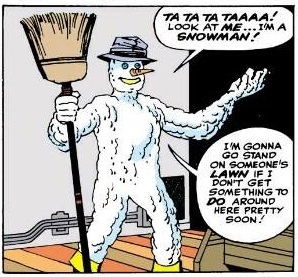 The Ice Man stuff is borderline offensive in such a charming way! Great opening piece Wil D! !